Pour the hot water into the flour and use the chopsticks to mix well. Then pour the cold water into the mixture. Knead the dough until it's elastic and smooth, which will take about 20 minutes. Then cover the dough with a wet tea-towel. Leave for 20 minutes. 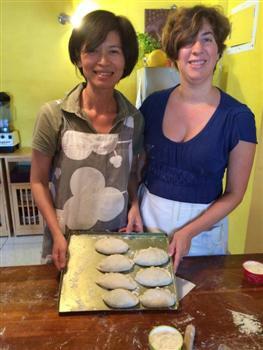 Roll the dough until it is 3cm (about 1 inch) thick, then cut it 3cm x 3cm pieces. Roll each piece into a ball shape. Flatten the ball into a round shape which is about 10cm (4 inches) wide. 1. Wash the cabbage and coriander, and allow them to dry in the air. 2. Peel off the pumpkin skin. 3. Soak the dry glass noodles in boiling water for about 5 minutes, then drain away the water. 4. 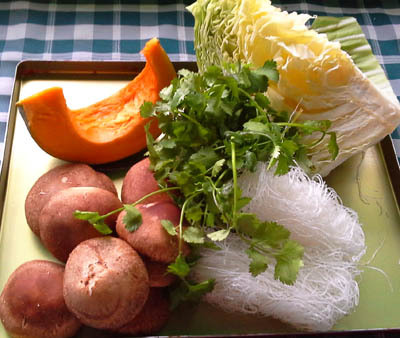 Chop these ingredients very small: cabbage, pumpkin, coriander, wet glass noodles. 5. Flavor the chopped ingredients with the seasonings. 6. Set the mixture aside for about 30 minutes. 1. 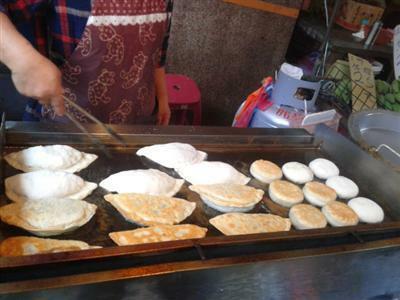 To make the pocket non-vegetarian: After the basic filling is prepared, you can add any the following ingredients and mix well: raw meat balls (mashed), minced pork, stewed chicken, pork or beef, cooked fish, fresh chopped shrimp or squid. Fill the circles of dough with your choice of filling, and fold the edges of the dough together so that the filling is completely enclosed. 1. Turn the heat low, and oil the frying pan. Pan fry the pockets until both sides are golden. Dumpling Engineering: Why is my dumpling dough coming out too sticky?